There are many different kinds of vision problems that people may experience. The most common are refractive errors, which result in blurry or hazy vision. These issues can be easily address through various surgical and non-surgical treatments, thankfully. We have a whole host of solutions for refractive errors at our Bakersfield laser eye surgery practice. Right now we'd like to go over the basics of refractive errors and how they can be most effectively addressed. Refractive errors refer to flaws in the shape of the cornea that affect a person's ability to see clearly. Refractive errors are more commonly known as myopia (nearsightedness), hyperopia (farsightedness), and astigmatism. When you visit our Bakersfield laser vision correction center for a consultation, we will be able to identify the refractive error you suffer from as well as its severity. Let's look at the different types of refractive errors in brief right now. Myopia refers to a condition in which it is easier to see objects that are nearby than objects that are at a distance. It is caused by light passing through the eyes and focusing short of the retina. Hyperopia refers to a condition in which it is easier to see objects that are at a distance than objects that are nearby. It is caused by light passing through the eyes and focusing behind the retina. Astigmatism refers to a general blurriness of vision that is caused by an unevenly shaped cornea. It often accompanies myopia and hyperopia. Astigmatism can also be caused by flaws with the shape of the natural lens of the eye. One of the most popular treatments for refractive errors is refractive surgery, most notably Bakersfield LASIK. 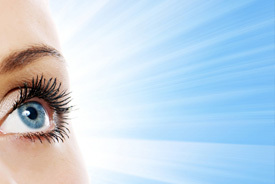 Laser eye surgery will safely reshape the curvature of the lens, ensuring that light passes through the eyes properly. There are similar alternatives to LASIK (e.g., LASEK and PRK) that achieve the same ends as LASIK surgery. CK is another option to consider, which uses safe radiofrequency waves rather than a laser to reshape the cornea. The most common non-surgical treatments for refractive errors are corrective lenses, such as prescription eyeglasses and contact lenses. These treatments are tried and true, used for many decades to improve people's vision. Since not all people are good candidates for LASIK surgery, corrective lenses are sometimes prescribed instead. Your ideal treatment will depend on a number of factors, including your current prescription, the health and condition of your corneas, and your age. When you visit our practice for a full consultation, we will be able to determine the best option(s) for you and your needs. For more information about refractive errors and other kinds of vision problems, be sure to contact our Bakersfield laser eye surgery center today. Our entire team will be here to answer your questions and address all of your concerns in greater detail.